The Boston Amateur Baseball Network draws amateur baseball players from across Metro Boston together. 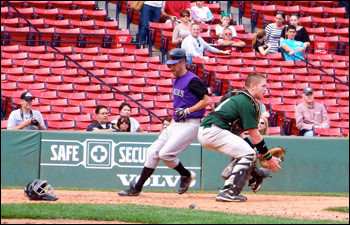 Keep up with local amateur baseball news, review the Boston Amateur Baseball League Directory, find a collegiate baseball program, explore local batting cages, or check Upcoming Events. Also, special thanks to our friends at SpecialCableDeals.com who are offering affordable prices on Comcast Sports Packages. 11/16/14: Join us at the 14th Annual Winterball baseball game, the Calling Birds versus the Drumming Drummers. 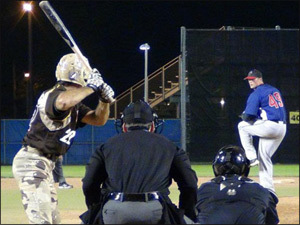 This annual game benefits the U.S. Marines' Toys for Tots program, as each player donates an unwrapped toy for the cause. No metal cleats, please, as we play on turf. Learn more Winterball details, and RSVP for Winterball on Facebook. Bring a toy and swing for the fences! 06/15/14: The 11th Annual 100 Innings of Baseball Game will support ALS through The Angel Fund. Walter Bentson, our umpire chief, continues his ALS fight, joined by Pete Frates, the Boston College baseball player and internet sensation responsible for the most succesful viral social media campaign in history: The Ice Bucket Challenge. Amount Raised: Still fundraising for 2014 game! Players - Register to play 100 innings of Baseball, 2014. Then set-up your personal fundraising page - and get people to sponsor you! Join the 100 Innings of Baseball, 2014 Facebook Event page to see photos and stay up to speed on updates. See the History of 100 Innings of Baseball. Players in support of Pete Frates at 100 Innings of Baseball. Visit the 2014 Cooperstown Classic page on Facebook, loaded with photos. Or see some professional photos from Cooperstown Time Company. Of note, Shlomo Lipetz, Israel's biggest baseball star, pitched a 10-inning lossfor the Hyde Park Rangers against the Charlotte All-Stars. 12/08/13: In the 13th Annual Winterball baseball game, the French Hens defeated the Turtle Doves, 7-5, in 37°, but otherwise perfect conditions. This annual snow hitter benefits the U.S. Marines' Toys for Tots program, as each player donates an unwrapped toy for the cause. The French Hens jumped out to a 1-0 lead after Chris Deane (Astros, Yawkey League) tripled in the second inning. The Hens hatched 4 more runs in the 3rd inning behind a couple of walks and singles by Kevin O'Leary (Giants, MSBL) and Ryan Bere (Blue Jays, MABL), bringing the score to 5-0. The Turtle Doves flew back into the game, making it 5-2, in the 4th inning with hits from Jeff Cabral (Dodgers), Peter Amico (Cantab Warriors, MSBL) and Brett Rudy (Brewers, MSBL). The game went into the 9th inning with the French Hens now up 7-4. The Doves chalked up a run and put the tying run on base with singles from Walden, Dan Sweet (Senators, MABL) and Brandon Wright (White Sox, MSBL) single, but the partridge settled onto the pear tree with a final of 7-5. See photos from the 2013 game on Facebook: Winterball XIII Photo Album. Review the Winterball Baseball Game's 13 year history. 10/13/13: The world's longest game played its 1,000th inning, completing it's 10th straight year of 100 Innings of Baseball. This year, Team Third Base defeated Team First Base, 79 to 69 in a shorter-than-usual 28 hours. Exactly 21 Iron Men played the entire game, setting a record. Fundraising for ALS, this year via The Angel Fund, has surpassed $600,000. Thank you to all the players, umpires, sponsors and contributors who have pitched in to make this game a success over the last decade! Chris Deane and Tom Trull earned co-MVP honors for their dish work, each catching more innings than knee-savers ever could have ever expected when they created their product. Well done, fellas. Read about the 100 Innings of Baseball game's 10 year history. 07/21/13: The Ben's Dream White Sox repeated as Champions at the 10th Annual Cooperstown Classic Tournament, defeating the Rhode Island Giants in the finals, 4-3. Learn more about the 2013 Cooperstown Classic. 06/10/13: As a Little League coach, I’m constantly encouraging my kids to keep their eye on the ball. For athletes playing for the Boston Renegades, it wouldn’t make much difference – they're all legally blind. The Boston Renegades are sponsored by the Association of Blind Citizens, and play a sport called Beep Ball. 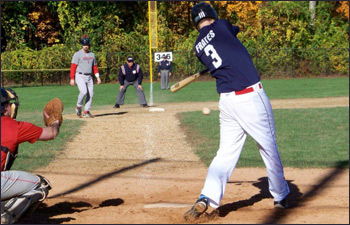 Since the athletes are without sight, the rules are different than traditional baseball. For starters, there are buzzing bases and beeping baseballs. Read the full story "Blind Baseball: An Eye-Opening Experience," an author's cut of what will appear in the July issue of New England Baseball Journal magazine - complete with a 7-video playlist of interviews with the athletes! 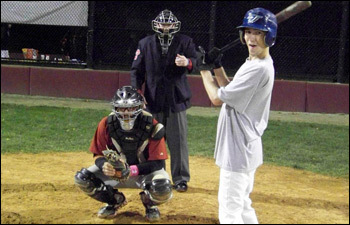 Or, check out the Beep Baseball Photo Album from the shoot for this article. 04/27/13: The Watertown Raiders high school baseball team returned to action a few weeks back at Victory Field, exactly one week after their game versus Arlington was cancelled due to the bombing and subsequent manhunt that led police into their back yard. The town put together a pre-game ceremony honoring Watertown Police and Fire. Watch the pregame ceremony video, the interview with head coach Aram Manoukian discussing his player's safety, and player Gabriel Rodriguez who was exposed to gunfire outside his home. Also check the photo album from pregame as Watertown returned to action. Read the full story "More Than a Game In Watertown" as appearing in the June issue of New England Baseball Journal magazine. Tyler Kendrick throwing knuckleballs on the Discovery Channel). 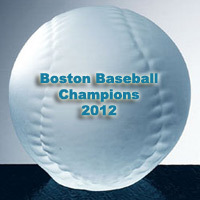 The full article will appear in the February 2013 edition of New England Baseball Journal magazine. of the Boston Amateur Baseball League which features the North Shore Reds. 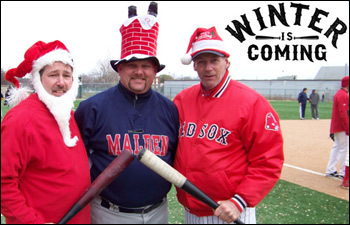 Read the full article, Better with Age, as it appears in the January 2013 edition of New England Baseball Journal magazine. 12/01/12:The 12th annual Winterball was a treat. The Rivier University Baseball Team was on hand to assist with collection of toys for Toys for Tots, and also to shag baseballs during batting practice for the participants. The game began with about 30 players ready to brave the crisp 28° snowy conditions. The Baystate Blizzard consisted of players aged 16-29, while the Atlantic Frost consisted of those aged 30+. The starting pitchers were Jay Thomas (MABL Blue Jays) for the Blizzard and Paul Anderson (MSBL Middlesex Brewers) for the Frost. In the final frame and trailing 8-3, the Frost made a comeback run as Steven Walsh (Yawkey's Beacon Hill Dodgers) doubled, Chris Deane (MSBL's Scituate Tides) got on, and Tommy McDonough (alumni from Yawkey's Somerville Alibrandis) hit one to the wall to drive 2 runs in. But the rally fell short, and the Frost froze at five. Thanks to all the volunteers, players, and umpires for their generous contributions of time and toys to support Toys for Tots. As a result of this game, lots of boys and girls will have a better holiday season. And there are plenty of 2012 Winterball Photos. Also, check out the 12-Year History of Winterball. Chris Deane works on his candy cane. Jay Thomas does his best Santa, delivering baseballs. 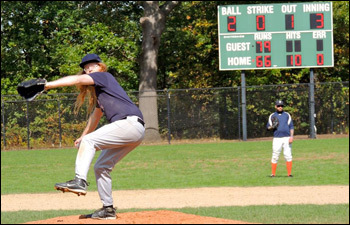 11/04/12: There are more than 80 amateur adult baseball leagues with more than 700 teams scattered across New England. Leagues offer a broad range of competitiveness, from weekend warrior to aspiring professional. Some leagues have short and condensed schedules over the summer, while others are spread from spring to fall. Some consist of young men just starting out life on their own, while others cater to the seasoned gentleman with families of their own. The one thing they all have in common is that they are filled with athletes continuing to live the dream of playing baseball as long as they can. For more details, grab the November issue of New England Baseball Journal. 10/22/12: This weekend, 100+ players and 90 umpires from across a dozen leagues in New England completed the 9th annual 100 Innings of Baseball, including Boston Red Sox legend Lou Merloni. Since the game's inception, the game has supported ALS and has raised more than $527,000 � with proceeds this year supporting The Angel Fund. Walter Bentson, chief umpire and this year's event organizer, was diagnosed 11 years ago with ALS � and spent the midnight shirt with his customary half inning behind the dish. Appropriately, Team Walter defeated Team Bentson, 90-80, in 100 innings, after overcomming a 22-run deficit earlier in the in the 3-straight-hour affair. Enjoy 150+ photos from the 100 Innings of Baseball Photo Album 1 and Photo Album 2. Or read up on 100 Innings of Baseball History with scores and photos from prior years. Join the game conservation on Facebook. And of course, thank you Reebok, VitaminWater, Extra Innings and the hundreds of individual donors who sponsored the game! 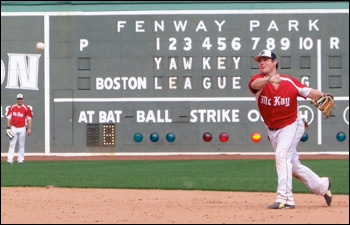 10/07/12: The Yawkey Baseball League All-Stars held its final tribute to the 100th Anniversary of Fenway Park yesterday. More than 50 athletes from the Greater Boston Area represented the 16 teams. A fantastic game by all, our thoughts go out to starting pitcher for Al Thomas Club, Chris McDonough, who broke his humerus bone during the game's first inning. Luckily, there was no nerve damage and surgery was not required. Heal up, Chris! 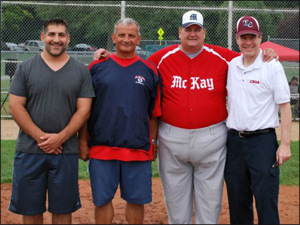 Enjoy about 230 photos from the 2012 Yawkey League All-Star Game. 9/29/12: The 9th Annual 100 Innings of Baseball for ALS, aka Lou Gehrig's Disease, this year will support The Angel Fund. Umpire chief Walter Bentson is coordinating all aspects of the game. If you've been wanted to get involved in the World's Longest Game, nine years and running, get involved now. Walter Bentson, Chief Ump, is Ready to Go. Alan Desmarais gets Pumped for 100 Innings. 9/25/12: Perfection is rare. 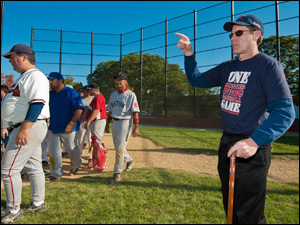 The JM Force of the Boston Men’s Baseball League were crowned American League champions in the Age 30+ division this year after finishing 29-0. They won 23 straight in the regular season, and then 6 more while sweeping three straight playoff series. Their average margin of victory in these games was more than 8 runs. For good measure, they even shutout the Middlesex Brewers in the Finals. With perfect equality, the odds of any team winning 29 straight games are 537,870,912 to 1. 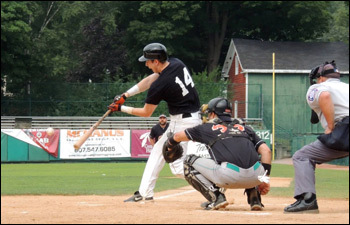 8/18/12: On Friday, August 3rd, the Middlesex Brewers defeated the Brockton A's, 12-2. But that's not the real story. Throwing together a charity baseball game is no small feat. The game itself is the easy part, not that different from any other game. The tricky part is coordinating the whole thing: obtaining a special venue, creating a draw for the participants, and motivating the athletes to lead the fundraising. Last month, Jim Sweeney of the Men’s Senior Baseball League’s Brockton Athletics pulled off his first charity game: KO Cancer. Even with no prior experience, Sweeney hit this one out of the park. 7/29/12: The 9th Annual Cooperstown Classic at the Baseball Hall of Fame featured 6 teams from 3 states. 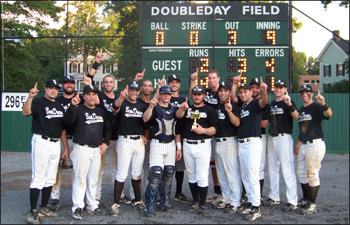 This year, New York's Ben's Dream White Sox defeated the Boston MABL Orioles, 14-2, to take home their first cup. On Saturday, just 2 of 6 games were played, as rain prevailed. With a modified structure coming into Sunday, the Boston Orioles, Ben's Dream White Sox and South Shore Cardinals all made the playoff bracket with a 1-0 record. The Newburyport Nationals also made the playoff bracket following a 4-3 loss (they hit a 3-run homer in the bottom of the 9th inning to keep it close.) In the semifinals, the Orioles won after a 10th inning homer, while the White Sox handily beat the Cards. In the finals, the White Sox then ousted the Orioles after a long tripleheader. See full scores. 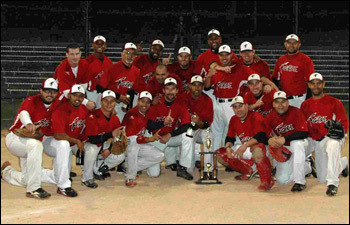 7/18/12: Boston’s top amateur baseball leagues had never come together to compete for a championship locally — until this year. 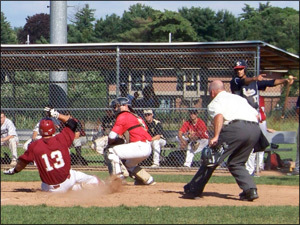 The inaugural Eastern Massachusetts All-Star Classic — held July 7-8 at Lexington High School — pitted Greater Boston’s four premier amateur baseball leagues: Boston Park League, Yawkey League, Intercity League and Cranberry League. When the dust settled, the Intercity Leauge claimed the city’s inaugural bragging rights, beating the Park League. 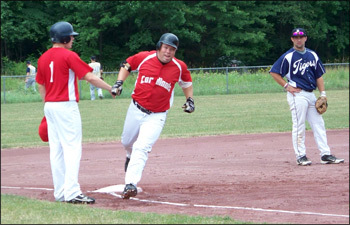 Read about how the game came together in Intercity League Claims Bragging Rights from New England Baseball Journal. See the 2012 Eastern Massachusetts All-Star Classic Photo Album. Watch the pre-game interviews with the managers. Dave McKay (Yawkey League) & Walter Benton (BPL). the Intercity League a 5-3 lead. 7/07/12: Most Little Leaguers dream of making it to the World Series. When it’s realized at age 12, you can spend the rest of your life trying to make it back. Only 11 players — including Jason Varitek, Gary Sheffield, and Dwight Gooden — have played in the Little League World Series and the Major League Baseball World Series. Dario Pizzano from Saugus hopes to join them one day, and this year’s MLB draft got him one step closer, as he was scooped up by the Seattle Mariners in the 15th round. 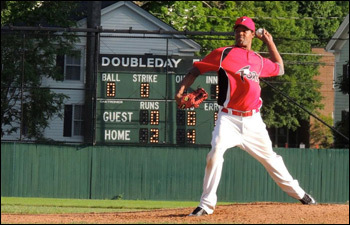 Read "From Little League star to draft pick" as it appears in the July 2012 issue of New England Baseball Journal magazine. Seattle Mariners on MLB Network. 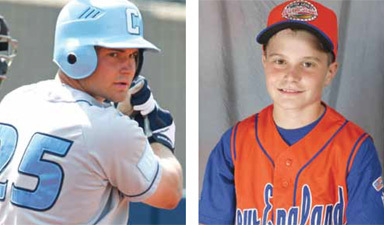 Dario Pizzano as the Ivy League Player of the Year at Columbia (left) andwith 2003 Saugus Little League World Series team in Williamsport (right). 6/14/12:The undefeated US Military All-Star baseball team barnstormed to Boston for a game Tuesday night at Fraser Field in Lynn, MA to play the Yawkey League All-Stars. They entered the game undefeated, but the Yawkey League had other ideas. The Military Team is a mix of former and current collegiate and professional players who have been or are being deployed in the Service of Our Nation. They use their annual leave time to join in what is called the Red, White and Blue Tour. 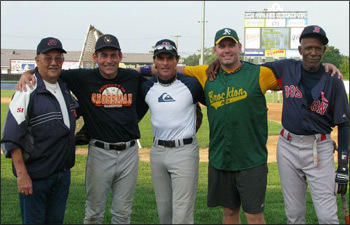 The two organizations have met annually for the last seven summers. The Yawkey League won the game, 8-3. 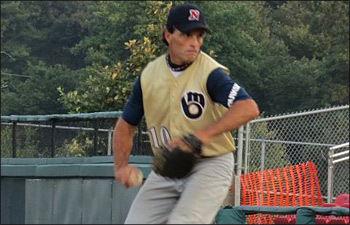 Doug Flutie, the former NFL and Canadian League hero and Heisman Trophy Award Winner out of Boston College, was on the bump to lead the way for the Military team. Doug was involved in three previous wins as a second baseman/pitcher this year. Chris Sandin started for the Yawkey Stars. 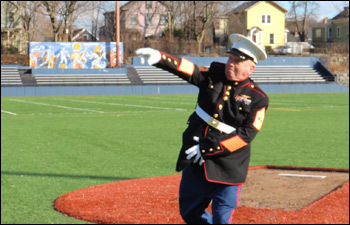 Tim Moore, US Navy Vet and YBL Fan was honored by the 9-11 American Hero Parade before the game.Tim is the Dad of John “Smokey” Moore of the Malden Bull Dogs. The Yawkey League had 8 runs on 18 base hits. Louis Rodriguez (3-4; 1R) and Tony Iafolla (3-4; 1R; 1RBI) were the MVP’s of the game. Both play for the YBL’s Revere Rockies. Drew Tambling (2-4) of the McKay Club bashed a line drive over the right field fence for a solo HR in the 4th inning. Mike Maguire (Somerville) was 2-4 with 2RBI at the plate. Chris Hartery of Revere (2-5) had a run scored and an RBI. Steve Lambert (Al Thomas) chipped in with a 2 for 5 and 1 RBI night. The Military Stars plated solo runs in the 1st, 3rd and 6th innings on 7 scattered base hits. Nine different YBL Pitchers were called upon to hold the Military Arsenal to just 3 runs. 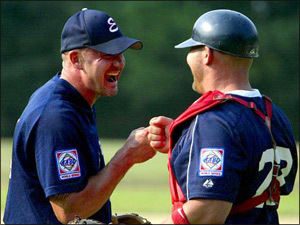 6/13/12: Many amateur ballplayers have absolutely no idea what national affiliation means, and many others don’t even know if their league has it. Yet, about one-third of the 69 amateur adult baseball leagues in New England are affiliated nationally — 25 of them, to be exact. 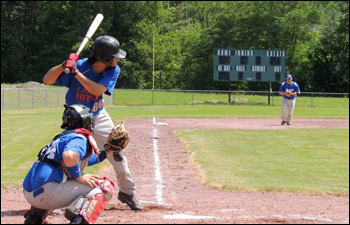 Yet, for the past 25 years, the Cranberry Baseball League of Boston’s South Shore was part of the AABC.In 2012, they moved to the NABF, established in 1914 and the oldest continually operated national baseball organization in the country. Read the full story on Inside Cranberry's National Move from Baseball Journal magazine to learn all about what national affiliation has to offer that you may not be aware of, as well as hear from Joe Paolucci, president of the Cranberry League in regards to the switch. 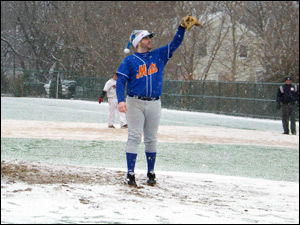 5/07/12: One thing ballplayers sometimes take for granted are the baseball fields on which they play. 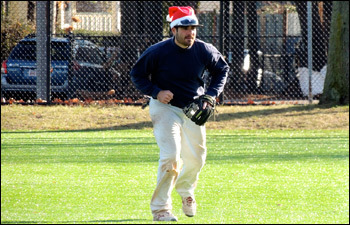 In the city of Boston, fields can be scarce for amateur adult players, which makes Paul McCaffrey the most valuable player for hundreds of teams. 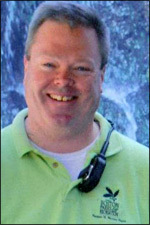 McCaffrey is the director of permitting for the Boston Parks and Recreation Department, which primarily assigns fields. Whether your team wins or loses, or even plays at all, comes down to when and where McCaffrey pencils you onto the schedule. Local ballplayers had many of questions in regards to how their local fields were assigned and are regularly maintained. We got to the bottom of it through this exclusive interview - and learned that assigning fields isn't all fun and games. Before your next game, be sure to read "Fielding Questions on Boston Parks." 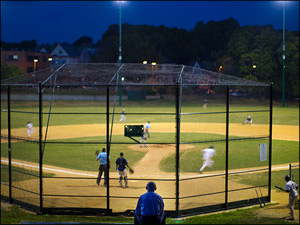 Fallon Field in Roslindale: One of Boston Park's Finest Fields. 4/08/12: It’s just quite possible that Little League is more for the parents than for the kids. If you have kids in Little League, or even if you don't, take a peek behind the curtain to see what really happens when kids tryout to be drafted - at least from one manager's perspective from the Wakefield (MA) Little League tryout. 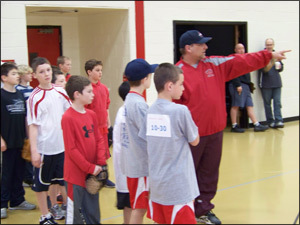 Read "Big Decisions at Little League Draft" as it appears in the April 2012 issue of New England Baseball Journal magazine. Wakefield Little League's Pete Beck instructs kids. 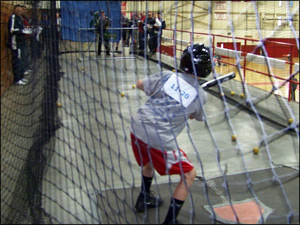 An 11-year old Little Leaguer hopeful takes a rip at tryouts. 3/17/12: It’s tough to hit .400. Just ask Mike Ganley, founder of 400Hitter, a baseball statistics application used by amateur baseball leagues across the country. In 15 years of playing amateur baseball in the Boston area for the Boston Yankees and Wayland White Sox, Ganley is batting .396 (233-for-588), a mere two hits shy of his own product’s milestone. It’s not as if Ganley can’t hit .400. He’s done it five times, including a whopping .534 in 1999 — a year after he won the Boston MABL’s Most Valuable Player award. 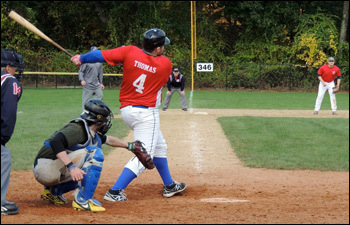 400Hitter is used by many of the area’s most established leagues, including the Boston Men’s Baseball League, Yawkey League, Intercity League, Cranberry League and Park League. 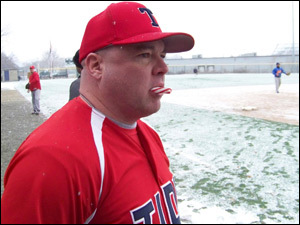 Read Mike Ganley's story in Building .400Hitter in this month's issue of New England Baseball Journal magazine. 3/04/12: While the college baseball season is already a few weeks old, the annual games the Northeastern Huskies and Boston College Eagles play against the Boston Red Sox always seems the true Opening Day to me. I'm not sure why, but it does.In this game, the college guys aren't expected to win, but they do have the time of their lives, playing against their boyhood heroes. Coming into the game, BC was 0-21 versus the Red Sox lifetime, though they entered the game 6-3 on their 2012 regular season. They lost to the Sox in 7 innings by a respectable score of 6-3. Tom Bourdon and Rob Moir each walked away with a pair of hits, while Nick Poore allowed just 1 hit over 2 innings while striking out 3 Sox batters. Meanwhile, NEU didn't fare as well. 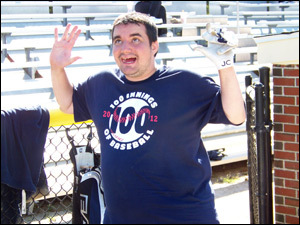 Coming into the game 0-9 lifetime versus the Sox and 1-2 on the young 2012 season, the Huskies fell to the Sox, 25-0. Pete Castoldi, Ricky Salvucci and Colby Mattheson had hits for the Huskies. The Sox once again illustrated why they are pros, and gave some of the best D1 players from the region a reason to keep working hard in an effort to live their dreams. 2/20/12: There was an awful lot of baseball this weekend, as several local teams headed south to play in the 18th Annual Caribbean Winter Baseball Classic. batting over .600, and catching most games. 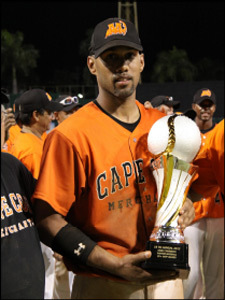 The Cape Cod Merchants won the the MSBL Caribbean Winter Baseball Classic 35+ division championship title in Puerto Rico this President's Day weekend. As the number three seed, they beat the New England Bandits in the morning game and outlasted the Chicago Aztecs in the afternoon contest. They faced the Rhode Island Cardinals in the title game, defeating them 12-5. Cape Cod Merchants in their dugout. 1/07/12: Baseball is about capturing moments in time. It is about witnessing memorable and unexpected plays. It is about the emotional roller-coaster you feel during a game, or over the course of the season. And baseball is about the game’s personalities, and the bond fans have with their favorite players. Baseball’s moments enter the history books just after they occur. All that is left are the memories. Capturing baseball’s memories are no small task. Good thing New England is home to some of the finest sports artists in the country. These folks are experts at painting corners and having a consistent stroke. Read the full article in the Jan/Feb 2012 issue of New England Baseball Journal, and see the 'outta the park' work from more than a dozen artists in the Grand Slam Baseball Art Gallery. Artwork examples from the Grand Slam Gallery by artists Brian Fox (David Ortiz), Kevin McNeil (Dustin Pedroia) & Justyn Farano (Jacoby Ellsbury).